I was invited for a fitness talk last night and one of the topics was "Barriers to Achieving Your Best Shape". When it comes to fitness goals, typically most people will only focus on the Physical State, but in this context, I’d like to offer a definition of best shape that includes Mental and Emotional States as well as the Physical. If you can align all these three states, you will feel like you are in that metaphorical “zone”, not just in the area of fitness, but also in the other areas of your life. Whether it’s personal development or fitness training, there are 3 barriers to achieving your best shape. These three barriers are excerpted from our current book “Fit to Lead”. 1. Resistant to being honest about “Where Am I”? Often I meet clients who have a great deal of enthusiasm when they talk about where they want to be in the future, but who are a lot more resistant about looking honestly at where they are right now. Everyone likes to focus on the destination and “the vision thing”, and while that certainly is important, trying to get to that point without stopping to clearly establish your starting point in life is a very common trap. As we say in our book, if you are not honest about where you start from in life, then you are doomed in any attempt to reach your desired destination. Telling the truth about your starting point often requires courage. You have to be willing to give up your image as a “good” person (whatever you think that means). Stop talking about where you want “To be” and start building your best shape by being honest about the “As is”. 2. Resistant to asking for and accepting support. In general, we have observed two main reasons why people are reluctant to ask for and/or accept support. Some people do not want to be a burden; they worry that other people are already busy enough and don’t have the time or the energy to support them. Other people see asking for and accepting support as a sign of weakness. They have their whole identity wrapped in their ability to be able to do everything required on their own, and see the need for support as a fundamental flaw in their own character. Your fitness goal is your personal goal, but that doesn't mean you have to do it on your own! 3. Resistant to the “Start now and start small” mantra. The desire for fast and immediate results is a common trend, but when it comes to fitness, it is not simply about the destination, it is also about embodying healthy choices and practices as we journey through life. This is what creates sustainable change. In our experience, people can be divided into two types when it comes to putting new behaviours in place. Some people resist getting started at all. There always seems to be a reason in their mental state pillar or a feeling in their emotional state pillar not to start now: “now is not the right time”, “I don’t know how to do it perfectly yet” or “I just don’t feel like it”. These are the great procrastinators, and underneath most, if not all, of their protestations is fear; fear of making a mistake, hurting someone else’s feelings or simply discomfort. Other people have no problem whatsoever with getting started. The word that they resist in the mantra is not “now”, but “small”. These people want to be on top of Mount Everest today. They are not interested in the small steps to get there. Their Mental State has them saying things such as “that’s too easy”, “it will take too long if that's all I do”or “there’s no challenge in that, so what’s the point”, etc. These people are often committed to getting started, rather than actually finishing. People with this mentality tend to quickly experience discomfort in their Emotional State and become frustrated, blow up or get bored along the way. They have tried to run before they can walk, and when they inevitably fall over, they tell themselves “it is impossible for me”, “it will take too long” or “something else is more important now”, and they go looking for something else to start and then the cycle repeats itself! At the beginning of my own fitness journey I was in this Mental State. I was good at starting things but not committed to actually finishing them. 11 years ago, I was one of those who paid a monthly gym membership just so I can enjoy my coffee in their comfortable lounge, rather than working out on their gym floor. I had no problem with “starting now” but I noticed my resistance towards “starting small”. Over time, I began to see how this did not serve my purpose. I had to tell the truth about where I was right now in my life and how my own mindset was holding me back. Once I realised this, I became certain that I wanted to choose a different attitude and stick to it. How did I do this? I found a goal to which I was emotionally connected. It took time to reach where I am today, but it has been worth the practice. 11 years ago, I was one of those who paid a monthly gym membership just so I can enjoy my coffee in their comfortable lounge, rather than working out on their gym floor. I had no problem with “starting now” but I noticed my resistance towards “starting small”. Over time, I began to see how this did not serve my purpose. I had to tell the truth about where I was right now in my life and how my own mindset was holding me back. When it comes to a fitness journey, there is no finish line, but you can always approach your fitness goal like a series of sprints and not a marathon. Always know that there is a pit stop coming up for you to recover, reset and relaunch yourself. Over time you will build the capacity to make healthier choices, in all three pillars. Physical, Mental and Emotional. Trying to build a great body with a Mental or Emotional State that does not allow you to grow is a fool’s errand. Your best shape (EVER) requires alignment across all of these states and yes, it will require you to get out of your comfort zone - physically, mentally and emotionally. So, be honest about where you start, declare a goal that you are emotionally connected to, enlist support, start now and start small. Then develop regular practices that will take you towards your desired end point. Sari Marsden: Co-founder of Sarius Performance International and co-author of "Fit To Lead". Sari is a PCC certified Coach, NASM Certified Personal Trainer, elite trainer with Nike+ Training Club and a Championship winning Fitness Physique Competitor for Team Singapore. FIT TO LEAD is a different kind of leadership book. 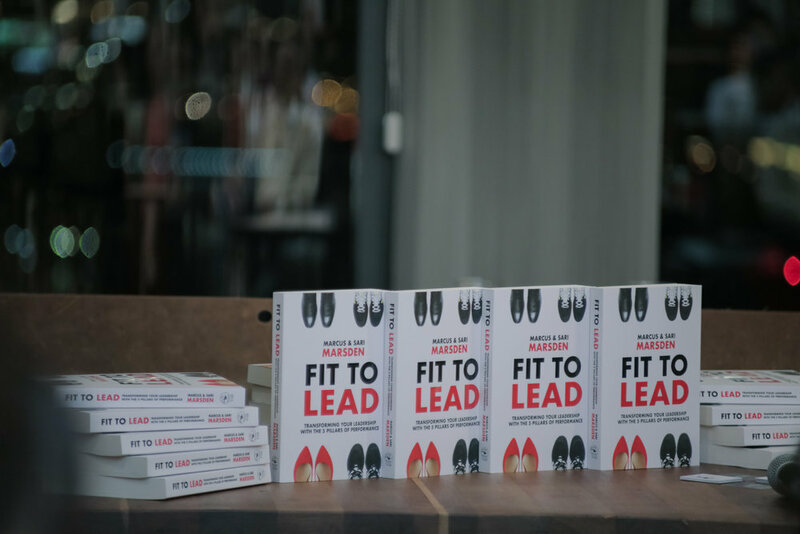 A book that combines executive coaching, physical movement and nutrition to transform your leadership. #FitToLeadSariusly! From Radio DJ to Performance Coach. Here's my story as featured in "It Changed My Life" by Kim Hoh, senior writer at The Straits Times Singapore. How leaders can be fit for the job. An interview with Vivien Shiao from The Business Times; integrating the heart, mind and body for maximum impact. Your physical state impacts your leadership. Check out what we say on First Look, Channel News Asia ! Superwomen: Are you always stressed? Professional coach Sari Marsden, our previous #BUSYWOMENINSPIRE feature, multi-medalist fitness model physique competitor & Nike+ Training Club trainer, shares how she encounters many ‘Superwomen’ inside and outside the gym. “What often makes things harder is that, even when overburdened by their commitments, Superwomen prefer not to ask for and/or accept support. They are constantly drowning in a sea of over-commitment. The two key reasons I see are: (i) She does not want to be a burden and worries that others are already busy enough and do not have the time or the energy to support someone else; (ii) She views asking for and accepting support as a sign of weakness. She views asking for and accepting support as a sign of weakness. Her whole identity is wrapped up in her ability to do everything required on her own, and she sees the need for support as a fundamental flaw in her own character. If you have a physical state goal, such as losing weight or improving your flexibility, be sure to check out your mental & emotional state - are they limiting (constricting) or expanding (enabling) your physical state?